If your guitar tone relies on some overdrive, delay, and reverb, meet your new best friend! The Analog Alien Rumble Seat packs three circuits into one rugged pedal, and it'll instantly supercharge your tone. The awesome overdrive section ranges from a virtually-clean tone boost to full, raging overdrive - and it's got amazing harmonic richness and complexity. The warm, vibrant delay section gives you everything from rockabilly-style slapback to haunting echoes. Finish up your tone with the sweet vintage-amp-style reverb, and you've got sonic magic coming out of your amp. 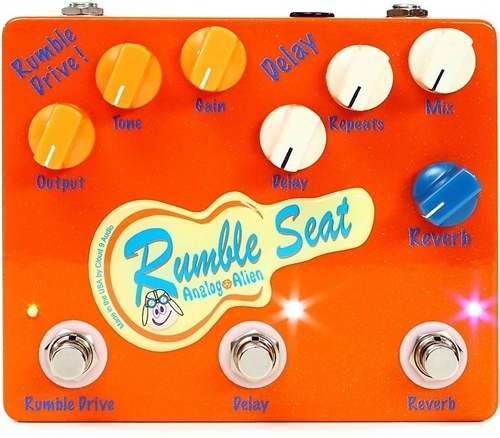 The Analog Alien Rumble Seat could be the key to your ideal tone!